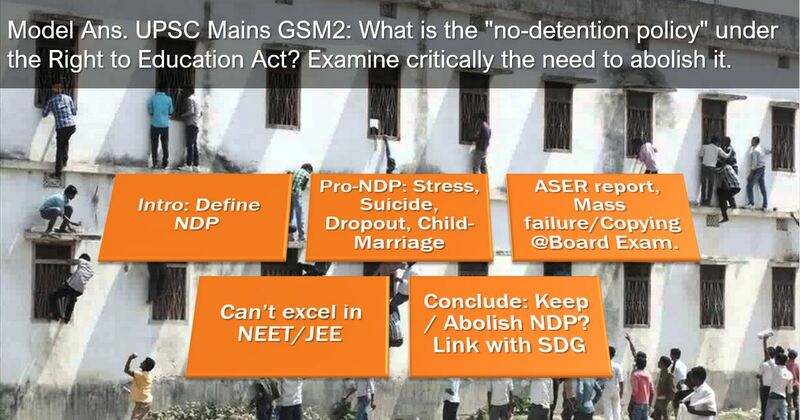 [Model Ans] UPSC Mains: Abolish No-Detention Policy in Right to Edu Act? Conclusion: YES Abolish करना मंगता है! Q2. What is the “no-detention policy” under the Right to Education Act? Examine critically the need to abolish it. 150 words, 10 marks. शिक्षा अधिकार कानून में ‘बच्चो को पिछली कक्षा में नही रोकने की नीति’ क्या है? इस नीति को खत्म करने की आवश्यकता की जांच करे. Relevance to the Syllabus of GSM2? Don’t write too long introduction from outside the stadium: 86th Amendment -> right to education -> to implement this act was enacted. 25% reservation to EWS. Instead of the traditional pass/fail type examination, the RTE act provides for a Continuous and comprehensive evaluation (CCE) but teachers to students ratio is not conducive for implementing it, and teachers are overburdened with election and other government duties. Therefore, both teachers and students become lax about the learning outcomes. NGO Partham’s Annual Status of Education (ASER) report: large number of class5 students can’t read textbook of class Half of class8 students can’t do basic arithmetic. High level of failure in class9 and 10. Instances of mass-cheating in board exams. Most of the Government school children can’t excel at JEE, NEET and other competitive exams for higher education since their basic reading and comprehension skills are poor. Schools no longer temples of education but glorified mid-day meal centres. TSR Surbamanian report has recommended abolishing the NDP. If NDP-abolition is not complemented with raising the teachers recruitment, infrastructure, funding and better accountability mechanisms, it may lead to a scenario where weak students will be forced to self-study or join private tuition classes. State governments declare many public holidays for populism. Government school teachers and children are kept occupied for the whole day for many government functions such as Sports Utsav, Yoga Day, Swachhta Pakhwada etc. As a result, in some states the total number of school days in a year are less than 150. NDP-abolition will lead to large number of students failing in each class. Could lead to stigmatization and suicide by the weak students. Mass-copying even in the school exams. Bihar and Andhra Pradesh state governments provide free bicycle for girls in classs8. If weak girl continues to fail in class7 itself, she’ll be deprived of the cycle and the associated mobility and safety. So, scheme entitlements may have to be linked with age, rather than standard. May lead to higher dropout ratio and child-marriages. Question says “Critically examine the need to abolish”, therefore, you should take a stand agree / disagree. Thus, no detention policy leads to children being promoted to higher class without learning or fear of failure. The scrapping the policy ought to improve learning levels. (DISAGREE) NDP alone is not the reason for poor learning outcomes in the government schools. Given the the peculiar socio-economic problems of rural Indian society viz a viz challenges in the operations of government run primary schools, the time is not yet ripe for abolishing the NDP policy until the other challenges are addressed first. Candidates are listing the pros and cons without taking a stand on whether it should be abolished or not because the question says critically examine the need to abolish it. Not mentioning upto which class this policy is applicable? In the conclusion candidates are giving long list of suggestion and their by crossing the word limit.